Alkyd-like performance in a water-based paint. 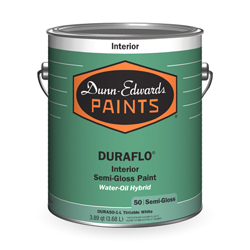 New DURAFLO® is formulated with a unique waterborne-alkyd resin that forms a solid bond to many painted substrates, including aged alkyd surfaces. The oily nature of this resin allows it to spread easily, while penetrating deep into the substrate. The result is outstanding adhesion for a more uniform, smoother surface that lasts. It is always recommended that DURAFLO® be used over properly prepared and primed surfaces.